Hi everyone! 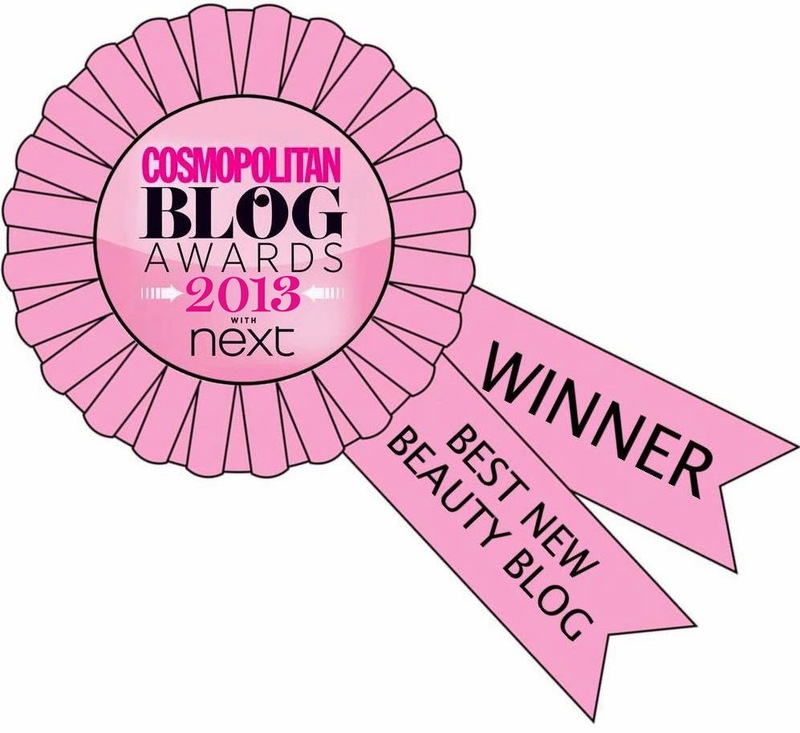 I'm Emily from the blog Very Emily and I'm so honoured to be guest posting on One Nail To Rule Them All today. I absolutely adore Alice's work, I always look forward to seeing what she creates. I just love her nails and her amazing style. Her work is always flawless! For my guest post I came up with a simple design using only three colours that requires no tools! On my pointer and pinkie I used a black polish, you can use any black you have lying around, I used Jessica Black Lustre. On my ring finger I layered a white polish, Essence Hattrick in this case, as a base. 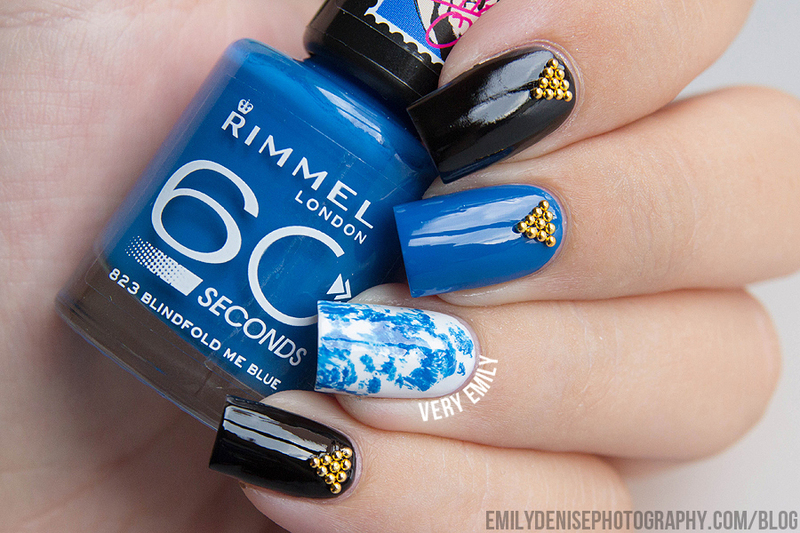 Then I layered a blue colour on my middle finger, here I used Rimmel Blindfold Me Blue from the Rita Ora collection. On my ring finger I used a stippling technique similar to the dry brush method. 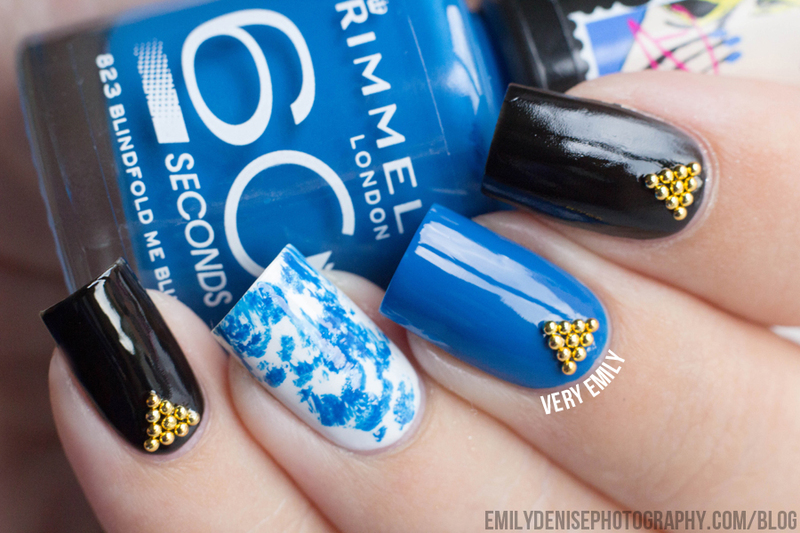 You wipe off most of the polish from your brush and just randomly dab it on your nail to create a fun abstract print. I really love how simple it is! Then I added some bling on all nails except for my ring finger! I used gold steel balls and placed them on one by one in a triangular line-up. I purchased mine from Born Pretty Store. 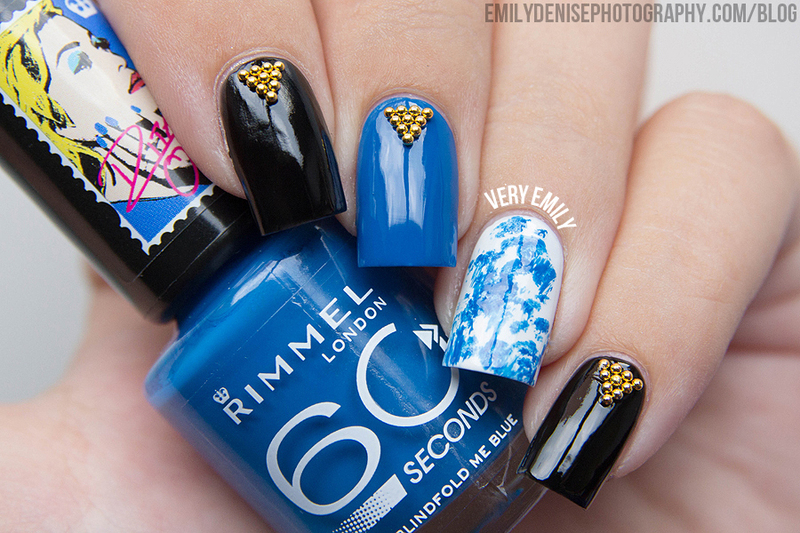 Feel free to stop by my blog over at Very Emily to see more nail art, swatches and reviews. Huge thanks to Alice for having me and I really hope you like these! Thankyou so much to Emily for doing this for me, I absolutely love that ring finger! Hehe the difference a year makes! Thanks Em! Wow cool effect on the ring finger! I really like these :D! So creative! I like the blue! I just opened a blog on nail art! have a look if you want you are welcome! Love it! Love the design especially the one on the ring finger. Love the effect. I also like the gold steel balls. Great job and great choice indeed!